An owl perches upon a branch in the snowy regions of North America. 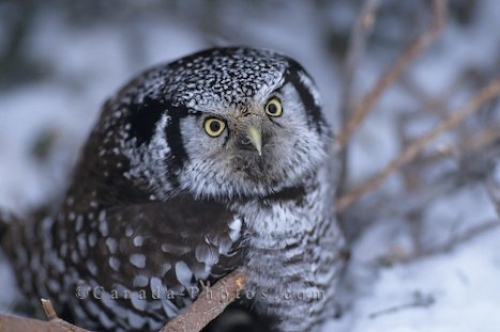 A Northern Hawk Owl lives in the Boreal Zones of North America and searches for food during the daytime hours. A medium sized owl with big yellow and black eyes and greyish brown plumage poses nicely for the camera. Picture of a Northern Hawk Owl found in the Northern regions of North America.